The Langton Exhaustive Shields roll contains just about every Langton shield that we have been able to discover plus a variety of related shields. 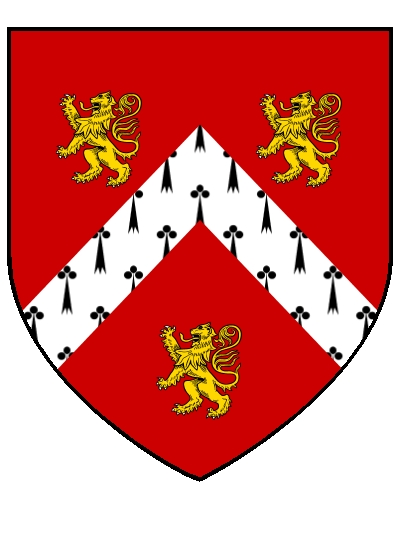 We include shields of names derived from Langton such as Lenton and Langston / Langstone as well as names which have less clear connections; Landon, Langhorn, Langthorn, Lanton, Longden, Longsden, Langstaff, Longstaff, and Laughton. All these mysterious relationships can be cleared up by DNA. If you have had your Y DNA tested then please send it in to us. If you have not had a y DNA test get into the 21st century and get tested by a cheek swab. We may be able to link you to some of the shields below. The roll records all significant variants, which almost certainly include mistakes. Shields were a source of status and so there was widespread borrowing by people claiming to be distant relations of a more famous family. This is why we get many examples of people with similar names having similar shields. Many of the shields described have corresponding images below them so that you can visualize what they would have actually looked like. As this article is so large, not all coats of arms have images yet, but those that dont, will be added in time until we have an image for each shield that is described. Leicestershire is in the English Midlands, Lancashire is in the North West of England. Whilst we have the DNA for Lancashire (Haplogroup i) we do not have samples from Leicestershire. If you are a Langton or a Lenton from Leicestershire please consider a DNA test. The Church Langton Thomas Langton memorial tomb in Leicestershire sadly no longer exists. This was probably the tomb of Thomas Langton arminger who died before 1471. He was in fact from the senior line of Langtons although heralds seem to think he was from the junior line. This confusion probably arises from the fact he uses the double headed eagle that came to the junior line of Langtons when Margaret Orrel married Robert Langton in Lancashire. The junior line’s lands in Leicestershire were transferred to their son Robert Langton of Lowe who used the double headed eagle. So either the senior line just assumed its use perhaps with some alteration for difference or a female from the junior line married a male from the senior line. The following three/four shields all seem to be different descriptions of the same thing. 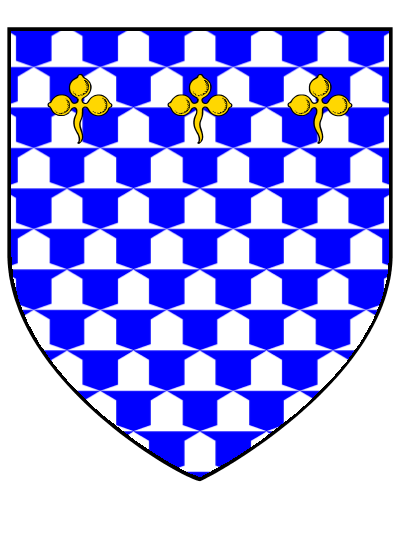 Burton’s actual description according to the Leicestershire Architectural Society is as follows: ‘Upon the monument of Thomas de Langton are engraved the arms of Langton…. 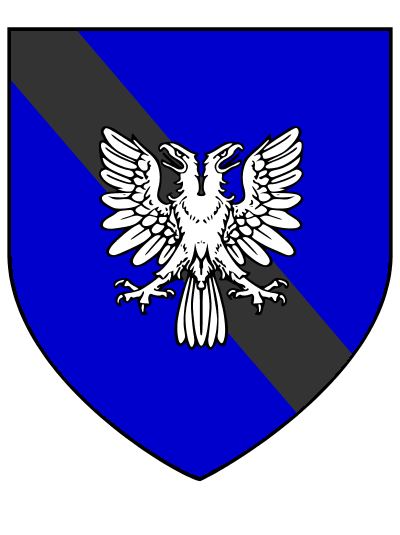 1 … Azure an eagle displayed with two heads; and argent, on a bend sable five bezants or. 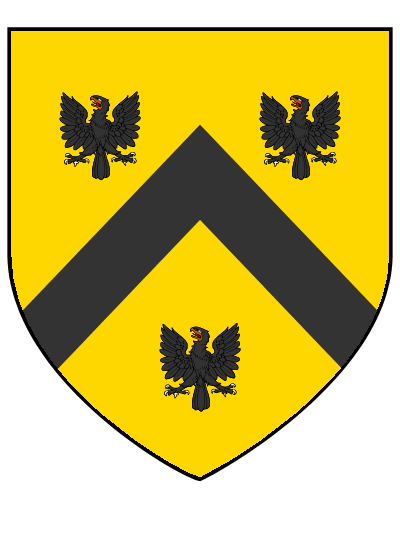 Given Burton’s description which seems to be the Langton arms impaling his wife’s or mothers arms, it makes me wonder if the description has been cobbled together into one, so that the bend sable has been superimposed onto the eagle which perhaps never had a bend. Clearly the description below in Burke citing Burton is different from this citation of Burton above. 2 Azure double headed eagle or overall bend sableBoth Papworth and Burke. Burke adds described by Burton. recorded by Papworth as from Glover and being Low of Low Lancs, but according to Papworth it is a mistake. Papworth then gives LOWE Co Lancaster citing Withie’s additions to Glover MS1459. However whilst Burke and Papworth do give this as Lowe they also give it as a quartering of LANGTON of Lowe, Lancaster. The same quartering of the eagle occurs in the earlier source the British Herald see 12. It seems clear that it is Langton of Lowe in origin but was then taken over by Lowes or a cadet branch of Langton who adopted the name Lowe. Edward Langton the last of the line d1733 sealed his will with argent an eagle displayed between two heads vert –Burke Encyclopaedia. William Langton’s interpretation of the above window is that it marks the marriage of a Langton of Lowe to a female of the De Orel family. (In fact Margaret Orel married Robert Langton of Newton. It was their second son Robert who was the first of the Langtons of Lowe). Whilst the Langtons of Lowe were a junior branch it was nevertheless, they who held the traditional Leicestershire Langton lands of the cadet branch with the effect that the eagle travelled south to Leicestershire. 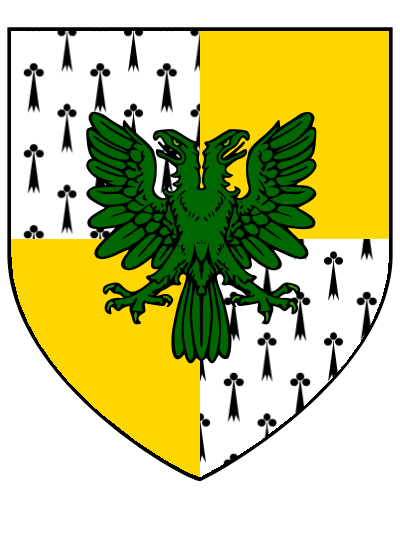 Richard De Orel had used the motif of the double headed eagle in 1307. 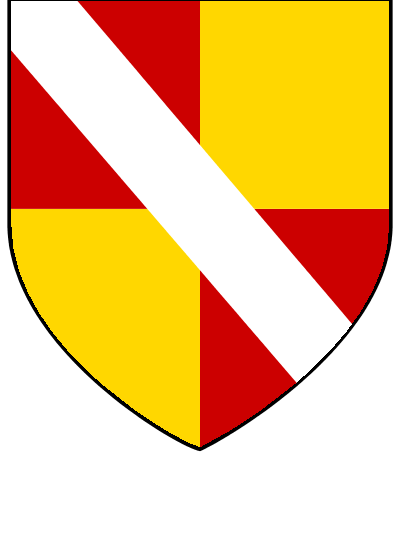 In 1368 it is central on shield of John de Langton of Lowe, Hindley (Harl Ms 2112) and may well have been in use before this date. William Langton discounts the historical existence of a family named Lowe. He says that Grafton in his book on Lancashire records the ‘imaginary’ family named Lowe. This still leaves a problem in that if the double headed eagle comes from de Orel through the twice junior line of the Langtons of Lowe how does it end up on the tomb of Thomas Langton of the senior line in Leicestershire? Entirely vair shields are rare probably because of the sheer number of squirrel skins required. Beside the Langton one the only other one is Beauchamp. There are others that are vair but have labels saving a number of skins, included among these is PEVERELL. 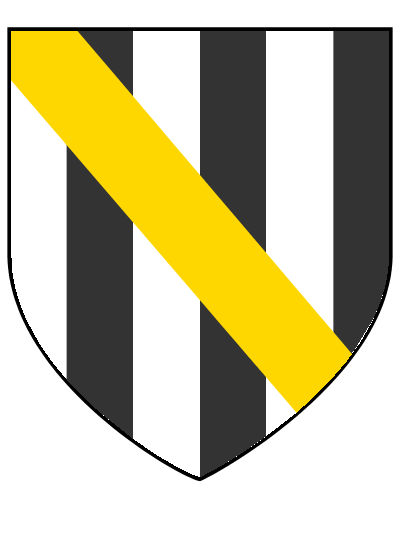 Then there are others that have the vair pattern but are described as vairy being argent and sable, or and sable, and or and vert. Maybe they used a painted colour in combination with white and black skins or maybe they just used paints. There are a number of Leicestershire entries argent/sable. Farmer/Farmour, azure/ermine Ward, or/sable Stanton. Many more shields occur with vair in combination with bends, chevrons, fesse etc which require fewer skins. It has been suggested by William Langton that the Langtons had vair because they were copying the overlords the Marmions who bore vair a fesse gules, however a copy increasing the amount of vair seems unlikely. 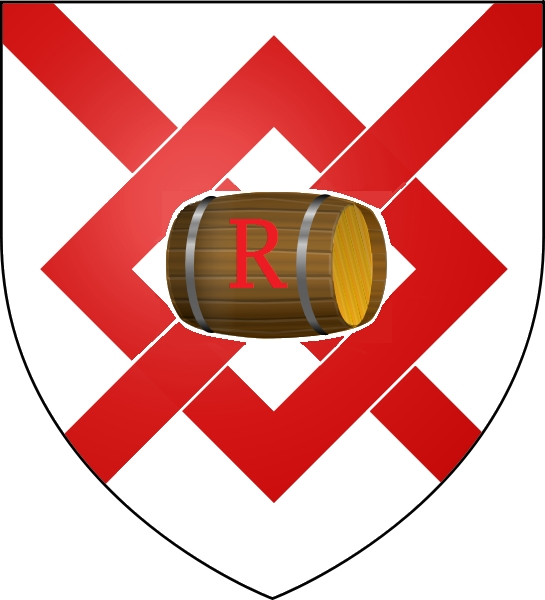 The obvious link is the Peverells who also bore a vair shield with a label gules. 21 Vair shield-West Langton Leicestershire William Langton Chetham Society, We have it attributed to John son of Richard. 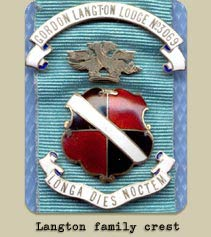 There is a John Langton assessed for half a knights fee in West Langton in 1428 probably from the Lowe line. We do not know his father’s name. 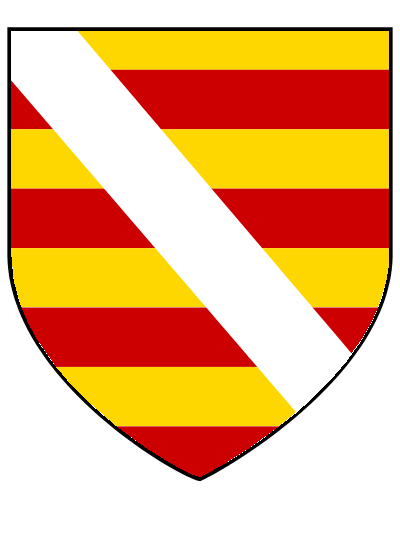 22 Argent 3 chevrons gules a bordure vair Robert Langton Lowe 1342 William Langton C.S. 24 Vair in chief three trefoils slipped or Source? Lancashire is in the North West of Englandhaplogroups j2, i2a1 and r. These shields relate to group i2a1. If you are a Langton or Longton from Lancashire you will need to get DNA tested to see if these shields are part of your history. If you are a Langston, Landon, Langdon or similar from outside of the UK your name may have drifted in form and you may match one of these groups. Only a DNA sample will tell. History of Flax Bourton Master c1850 Impaled by Gore representing the marriage of Gore to his cousin the daughter of Joseph Langton of Newton Park Bath. 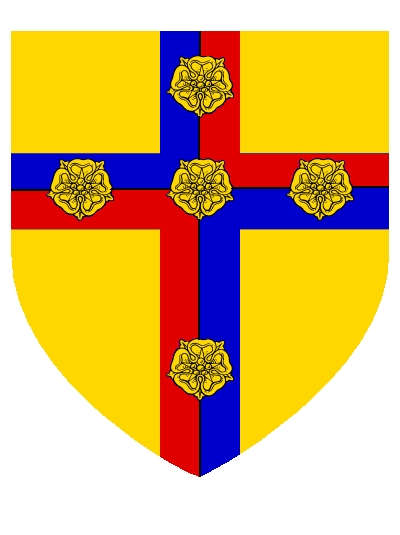 The correct Langton shield (according to official records) is the Lincolnshire quartered either sable/or or or/gules. So why this mistake? 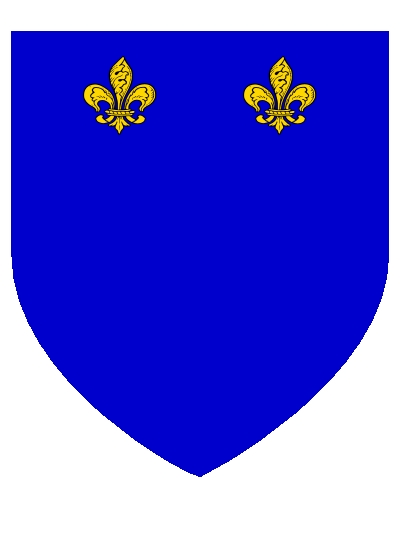 39 Argent 3 chevronelles gules, label of 3 points azure Christopher De Langeton Willement’s roll published as Temp Richard II 1377-99. Also Langton of Lowe Hindley chevron ref? 42 Argent 3 chevrons sable in dexter chief an annulet for difference. The Banastre cross occurs quartered with Langton following the marriage of John Langton to the Banastre heiress of Makerfield. Other Banastres continued to hold land further to the north within Lancashire around Preston. It is possible that there was some name swapping between the Langtons and the Banastres so if your name is Bannister send in your DNA and we’ll check just in case. Beltz Memorials describes Banastre cross relating to Order of the Garter as cercelee meaning it’s voided of the field. However William Langton says a woodcut based on a tracing shows it as normal. Beltz could of course still be right. Would he add an unusual term cercelee for no reason? Foster in 2Tud 2169 in what is a very confused entry shared with Percehaye who have similar shields recorded in Burke. It may be Langton but is more likely Percehay. The image immediately above in Foster is a cross Moline recercelee belonging to a previous entry. But given Beltz’s recording above that the Banastre cross was cercelee was it this that put Langton into the mind of the roll writer to mess the entry up by adding in Langton. Something must have made him write Langton and enter a duplicate Langton entry. If you are a Langston, Landon, Langdon or similar from outside of the UK your name may have drifted in form and you may match one of these groups. Only a DNA sample will tell. Lancashire is in the North West of England. We have three sequences of DNA from Lancashire from three different haplogroups j2, i2a1 and r. These shields relate to group j2. If you are a Langton or Longton from Lancashire you will need to get DNA tested to see if these shields are part of your history. If you are a Langston, Landon, Langdon or similar from outside of the UK your name may have drifted in form and you may match one of these groups. Only a DNA sample will tell. 51 Or/argent 3 water bougets azure/sable Langton reconstruction. The most likely explanation of all these shields is that they are all De Longeton (Langton) shields. Note Papworth’s ascription of 237. The cross is well attested back to the middle of the Fourteenth Century. It is difficult to see how one Langton family (Wigan) could have two different shields going for so long and of such antiquity. I am unconvinced by Jones’ ascription of shield 233 to William of Kilvrough 1310-2. William was a Yorkshire Langton and Jones cites no evidence. The above is cited in W H Jones History of Swansea and the lordship of Gower as the shield of Sir William Langton of Kilvrough c1310-12 but it is unclear what is the original evidence for this. 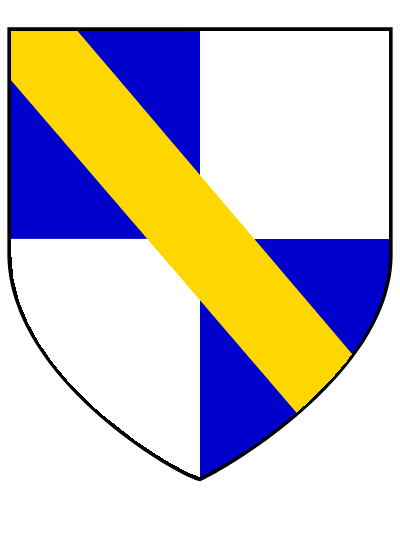 65 Quartered or and azure cross flurry gules Burke & British Herald (ascribed to Rauf Langton in my notes don’t know why? 66 Per fesse or and azure cross moline gules over it a bend sable Berry Appendix Burke and Robson British Herald. Jenyns Ordinary in Some Feudal Coats. Re-cerkelee means recircled in other words a border or strip. This means the cross is voided of the field. However this adds a complication because the field itself is divided per pale. However it can’t be denied that the end result is very colourful. Staffordshire is in the English Midlands surrounded by Shropshire, Derbyshire, Leicestershire, Warwickshire and Worcestershire. We have four (another one being processed expected soon) DNA sequences from the English Midlands, two from Haplogroup r including a very rare one and two samples from group i2a. If you want to know if this shield is part of your history you will need to get DNA tested. This shield is associated with the rare group r sample. In particular we need samples from Leicestershire, Derbyshire, Nottinghamshire, Northamptonshire and Cambridgeshire so if your name is Langton, Lenton, Langston, Laynton or Landon and you come from these areas get swabbed for your DNA. If you are a Langston, Landon, Langdon or similar from outside of the UK your name may have drifted in form and you may match one of these groups. Only a DNA sample will tell. The Orle probably belongs to an independent group of Langtons in south east Staffordshire. 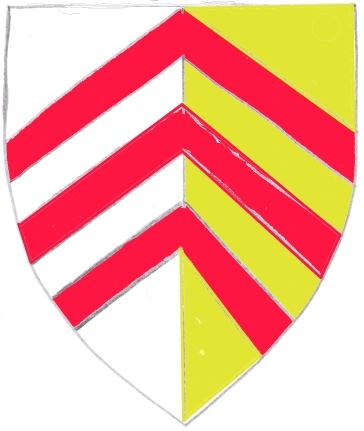 It is also possible although far less likely that this shield may have been adopted by the junior or illegitimate branch of the Langtons in South East Staffordshire after the execution of Ralph Langton Baron of Walton after the Batttle of Shrewsbury in 1403. The orle is associated with Raffe. It is easy to understand why a Raffe Langton wouldn’t want to go round with 3 chevrons gules. 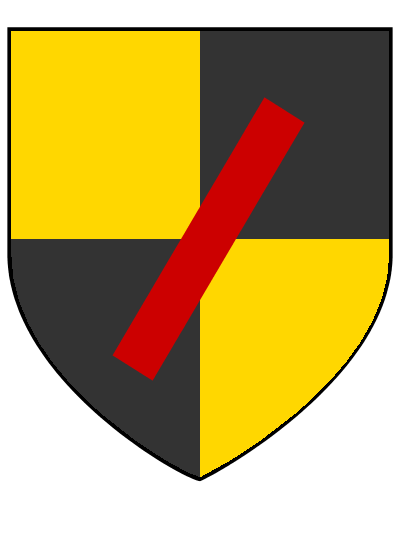 71 Gules orle argent a bend gules(sable?) Sir Rauf Elford Staff 1419 Source? 75 Same design of orle with a bend Norton Church Durham. Said to be either John Lythegrenes or Ralph Langton according to Archaeologia Aelina Vol 15 1892. This looks like a guess (wrong). Staffordshire is in the English Midlands surrounded by Shropshire, Derbyshire, Leicestershire, Warwickshire and Worcestershire. We have four DNA sequences from the English Midlands (with another one in the pipeline), two from Haplogroup r including a very rare one and two samples from group i2a. If you want to know if this shield is part of your history you will need to get DNA tested. In particular we need samples from Leicestershire, Derbyshire, Nottinghamshire, Northamptonshire and Cambridgeshire so if your name is Langton, Lenton, Langston, Laynton or Landon and you come from these areas get swabbed for your DNA. If you are a Langston, Landon, Langdon or similar from outside of the UK your name may have drifted in form and you may match one of these groups. Only a DNA sample will tell. Lancashire is in the North West of England. We have three sequences of DNA from Lancashire from three different haplogroups j2, i2a1 and r. These shields relate to group j2. If you are a Langton or Longton from Lancashire you will need to get DNA tested to see if these shields are part of your history. If you are a Langston, Landon, Langdon or similar from outside of the UK your name may have drifted in form and you may match one of these groups. Only a DNA sample will tell. 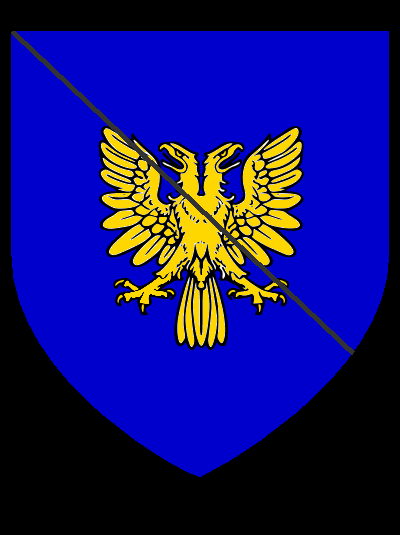 This is attested as a twelfth century shield and the Langtons or a Langton must have had it late twelfth or thirteenth century. That leaves us with plenty of questions for this early shield. The attribution to Staffordshire as well as Lancashire is very interesting and it makes it the Staffordshire Langton shield. There were a lot of Mauveysins in Staffordshire and Shropshire. A lot of them seem to have died out. Don’t know if the surname survives in any forms today. 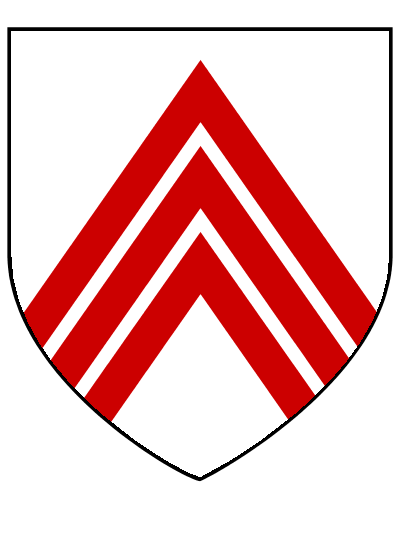 Although this version is not attributed to LANGTON one suspects this is the more correct version of the shield. Enhanced means the positioning of the three bends is above the normal central positioning. 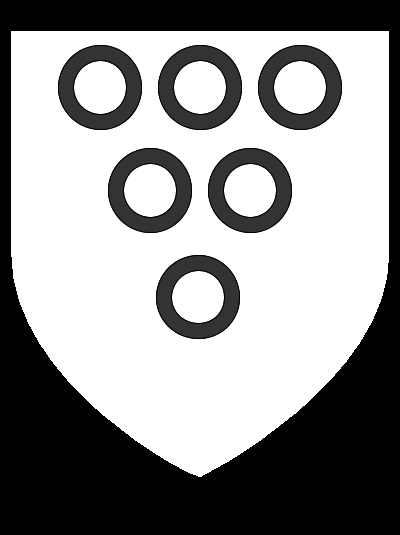 One would think this means that the third bendlet starts at the top left corner of the shield or perhaps issues from the top of the shield with the other two bendlets crammed into the corner, the first bendlet being very short. Bishop Walter, Treasurer of England and 53rd richest man of all time, father of several sons was from Leicestershire in the English Midlands. It is surrounded by Derbyshire, Nottinghamshire, Cambridgeshire, Northamptonshire, Oxfordshire, Warwickshire, Worcestershire and Staffordshire. We have four DNA sequences from the English Midlands, two from Haplogroup r including a very rare one and two samples from group i2a. If you want to know if this shield is part of your history you will need to get DNA tested. This shield is associated with a group r sample. In particular we need samples from Leicestershire, Derbyshire, Nottinghamshire, Northamptonshire and Cambridgeshire so if your name is Langton, Lenton, Langston, Laynton or Landon and you come from these areas get swabbed for your DNA. If you are a Langston, Landon, Langdon or similar from outside of the UK your name may have drifted in form and you may match one of these groups. Only a DNA sample will tell. 96 Goules, a les crusules patee de or e une fesse de argent. Moore Knights of Edward I Sir Robert Peverel of Ashby Castle brother of Bishop Walter. 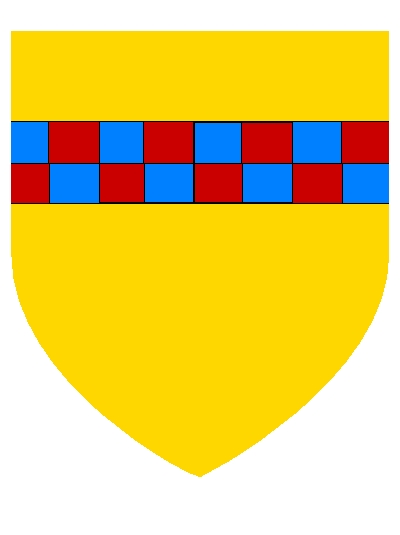 97 Or 3 chevrons gules overall a crozier on a bend argent Glover Statford or Langthorne at Bogh Abbey. 98 Argent 3 chevrons gules a label of 3. This is an allocation rather than an actual recording. However it is a fact that there is an ancient sculpture of three chevrons in a place sometimes historically called Stratford Langton together with an associated crest of a tun showing the pronunciation Langton for Langthorne. 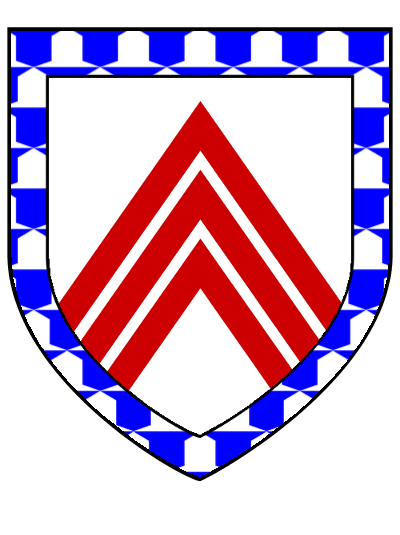 Given Walter’s immense wealth and his relationship with John Langton of Newton in Makerfield (argent 3 chevron gules) it is possible that Walter used the three chevrons. If so the three pottery finds of three chevrons from this period in London are probably his. (See Thorn Heraldic Jugs of Forgotten Potteries p371-377 c1890) Further the seeming determination of Stratford Langthorne abbey to be pronounced Langton and their adoption of the 3 chevrons is most likely an attempt to ingratiate themselves with Walter and he could easily have been their patron. This would explain the otherwise bizarre feature on their shield of a label of 3 (See photo Newham Art and History) indicating an eldest son for such was Walter. His mistress who was most likely of Langton (Lincolnshire) descent lived just up the road in Essex. Essex is the eastern part of London and beyond. It is close to Suffolk, Hertfordshire, Buckinghamshire and Bedfordshire. We have three DNA samples from London and the South of England, two of which are haplogroup I and one is haplogroup j2a. To find out if you match any of these you will need to get swabbed. There has been considerable drifting of the form of surnames in London. If your family originally comes from London and your surname is Langton, Langston, Landon, Lenton, Lutton, Langthorn, Logsdon or Langhorn then please get DNA’d. If you are a Langston, Landon, Langdon or similar from outside of the UK your name may have drifted in form and you may match one of these groups. Only a DNA sample will tell. Essex is the eastern part of London and beyond. It is close to Suffolk, Hertfordshire, Buckinghamshire and Bedfordshire. We have three DNA samples from London and the South of England, two of which are haplogroup I and one is haplogroup j2a. To find out if you match any of these you will need to get swabbed. There has been considerable drifting of the form of surnames in London. If your family originally comes from London and your surname is Langton, Langston, Landon, Lutton, Lenton, Langthorn or Langhorn then please get DNA’d. If you are a Langston, Landon, Langdon or similar from outside of the UK your name may have drifted in form and you may match one of these groups. Only a DNA sample will tell. 108 Stone arms- 3 chevron- of Stratford Langthorne Abbey show shield of label of 3 indicating the shield of an eldest son and a crozier bendwise Door to the Old Court House Tramway Avenue. Bedfordshire is to the north west of London and beyond. It is close to Northamptonshire, Hertfordshire, Buckinghamshire and Oxfordshire. We have three DNA samples from London and the South of England, two of which are haplogroup I and one is haplogroup j2a. To find out if you match any of these you will need to get swabbed. There has been considerable drifting of the form of surnames in London. If your family originally comes from these areas and your surname is Langton, Langston, Landon, Lutton, Lenton, Langthorn, Logsdon or Langhorn then please get DNA’d. If you are a Langston, Landon, Langdon or similar from outside of the UK your name may have drifted in form and you may match one of these groups. Only a DNA sample will tell. John Langton was chancellor of Cambridge University where he has descendants. He was originally from Leicestershire. Cambridgeshire is in the English Midlands surrounded by Lincolnshire, Norfolk, Suffolk, Essex, Bedfordshire, Buckinghamshire. Leicestershire is surrounded by Derbyshire, Nottinghamshire, Cambridgeshire, Northamptonshire, Oxfordshire, Warwickshire, Worcestershire and Staffordshire. We have four DNA sequences from the English Midlands, two from Haplogroup r including a very rare one and two samples from group i2a. If you want to know if this shield is part of your history you will need to get DNA tested. This shield is associated with a group r sample. In particular we need samples from Leicestershire, Derbyshire, Nottinghamshire, Northamptonshire and Cambridgeshire so if your name is Langton, Lenton, Langston, Laynton or Landon and you come from these areas or from Wales get swabbed for your DNA. If you are a Langston, Landon, Langdon or similar from outside of the UK your name may have drifted in form and you may match one of these groups. Only a DNA sample will tell. Berkshire is a county in the south of England to the west of London. It is surrounded by Wiltshire, Oxfordshire, Hertfordshire, Surrey, Hampshire and Dorset. We have three DNA samples from London and the South of England, two of which are haplogroup I and one is haplogroup j2a. To find out if you match any of these you will need to get swabbed. There has been considerable drifting of the form of surnames in London. If your family originally comes from these area or Berkshire and your surname is Langton, Langston, Langstone, Landon, Lenton, Langthorn or Langhorn then please get DNA’d. If you are a Langston, Landon, Langdon or similar from outside of the UK your name may have drifted in form and you may match one of these groups. Only a DNA sample will tell. Langtonwick Berkshire is referred to by British Herald, Papworth and Burke. W.N.Clarke Parachial Topography of the Hundred of Wanting 1824 p30 Under the heading Arms of Families whose Pedigrees occur in the visitation of 1664-5 only. Langtonwick might be Langdonwick near Marlborough Wiltshire or Langtons near Sharnbrook Bedfordshire. There is another Langdonwick in East London. So if you are a Langton, Langdon, Landon or Langston from Wiltshire, London, Bedfordshire or Northamptonshire read the DNA article. Cardinal Stephen Langton, hero of the Magna Charta was born in Langton by Horncastle, Lincolnshire and had descendants who are more likely to live in Yorkshire, Essex, Hertfordshire, Bedfordshire or Northamptonshire. There has been considerable drifting of the form of surnames. If your family originally comes from these areas and your surname is Langton, Langston, Landon, Lunnon, Lenton, Langthorn, Logsdon or Langhorn then please get DNA’d. If you are from outside the U. K. and you believe you might be a descendant of Stephen Langton send in your DNA. 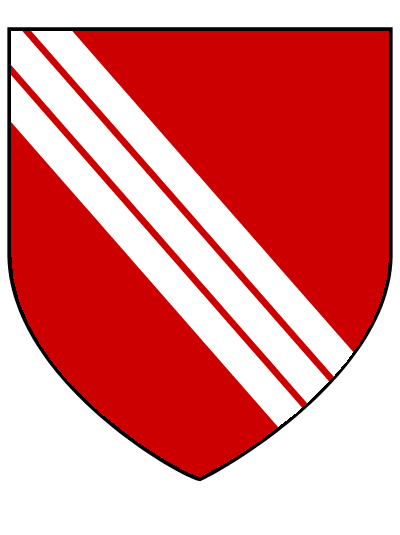 121 Furled per pale sable and or a bend argent surmounted by a cardinals hat. Painted window in the Sorbonne Paris. Archbishop Stephen Langton, hero of the Magna Charta was born in Langton by Wragby Lincolnshire and had descendants who are more likely to live in Yorkshire, Essex, Hertfordshire, Bedfordshire or Northamptonshire. There has been considerable drifting of the form of surnames. If your family originally comes from these areas and your surname is Langton, Langston, Landon, Lunnon, Lenton, Langthorn, Logsdon or Langhorn then please get DNA’d. If you are from outside the U. K. and you believe you might be a descendant of Stephen Langton send in your DNA. 122 Per pale azure and gules a bend or Berry Papworth. This same shield is also attributed to Stephen's brother Simon Langton, who was Archbishop of York in 1215 at the sealing of Magna Carta. A variation is still in use today by the Simon Langton Grammar School. Per Pale azure and gules a bend or Hasted Historical and Topographical Survey of Kent Vol 12 1801 quoting Archbishop Parker. 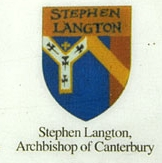 Archbishop Stephen Langton, hero of the Magna Charta was born in Langton by Wragby Lincolnshire and had descendants who are more likely to live in Yorkshire, Essex, Hertfordshire, Bedfordshire or Northamptonshire. There has been considerable drifting of the form of surnames. If your family originally comes from these areas and your surname is Langton, Langston, Landon, Lunnon, Lenton, Langthorn or Langhorn then please get DNA’d. If you are from outside the U. K. and you believe you might be a descendant of Stephen Langton send in your DNA. Lincolnshire is in the eastern part of England. To the north is the giant county of Yorkshire, to the west is Nottinghamshire and to the south Cambridgeshire. There were at least two and possibly three Langton families from Lincolnshire as well as a Landon / Landen one. These shields are associated with the group i DNA from Langton by Spilsby. If your name is Langton, Lenton or Landon and you come from these areas send in your DNA. A further separate family of Langtons originate from Nottinghamshire. If you are a Langton from Nottinghamshire or Derbyshire be the first to record this missing sequence of DNA that dates back to the time of Henry III in 1250. If you are a Langston, Landon, Langdon or similar from outside of the UK your name may have drifted in form and you may match one of these groups. Only a DNA sample will tell. The Langton by Spilsby/Partney arms are quarterly sable and or, black and gold. The evidence for the reverse or and sable is very thin. The earliest recording is Bishop John Langton 1447 or/sable bend sable see No 148 below but the evidence as to his origin strongly points to Leicester where he was the rector of West Langton. It may be that he was using a quarterly version of archbishop Stephen Langton’s cardinal shield No 92. The oldest Lincoln or/sable shield is the baston shield of the unidentified J Langton Lincs reported in Surtees Ashmole 834 See No 154 below –but I’m not sure of the date or when the ascription was made. The later emphasis on ‘dexter bend’ is to assert legitimacy and dissociate from this entry. Finally there is the 1716 entry in the Alphabetical Dictionary Papworth/Morant directly contradicted within the same volume. 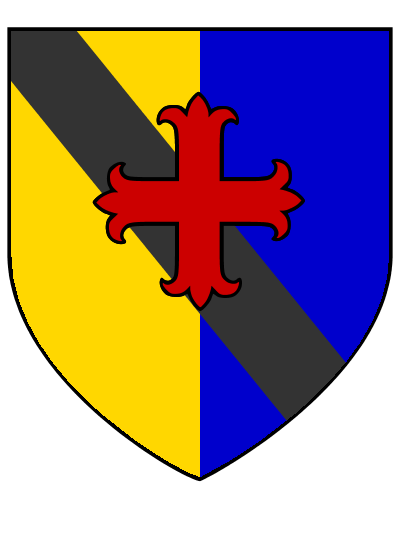 It is possible that this shield never existed but is simply Morant’s correction of sable/or perhaps inspired by later heralds rules that a metal must always come first in any quartering. However the earliest recording of the shield is black and white with a gold bend which both sounds primitive and has the same colouring as the paly of 6 shield. 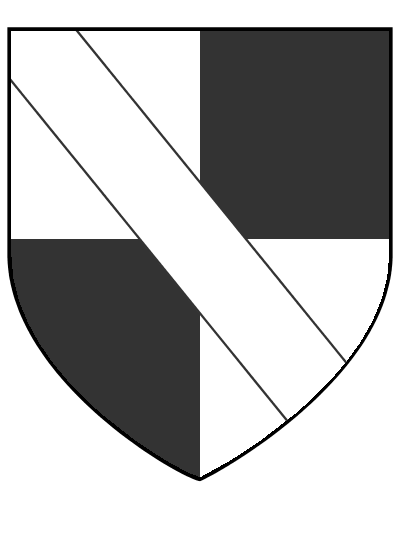 Quartered; First quarterly sable and or overall a bend argent. 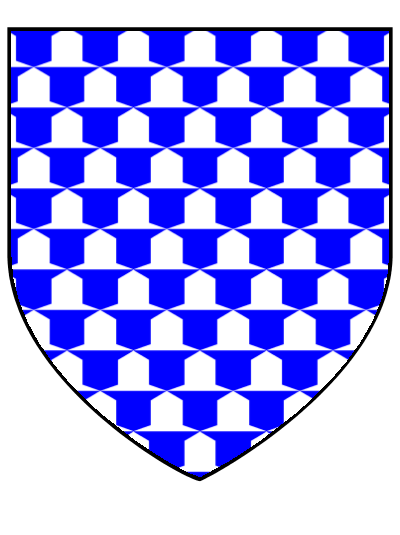 Second or fretty azure (Wood adds on a canton gules, a cross molyn or but this is not shown.) 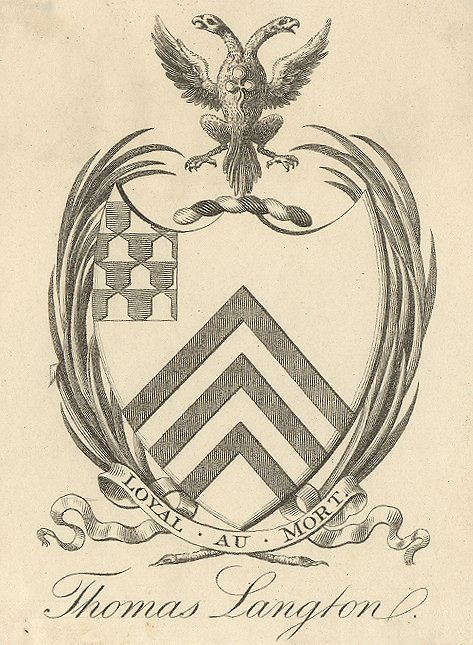 Third sable four falcons Volant or (2 & 2) argent (Wood says possibly Lincolnshire family of Mure) Fourth as first. Another source describing the same monument describes the first quarter as or and sable with a crescent in chief and makes no mention of the bend. Moreover he claims his tinctures came from Wood. 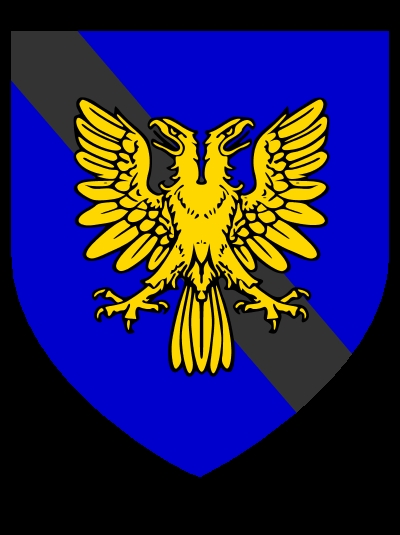 Peregrine Langton took on the name Messingberd and took on the Messingberd shield. If you are a Messingberd of Langton descent please send in your DNA. 157 Per chevron sable and or, in chief two eagles rising gold. Bennet Langton of Langton by Spilsby, Linolnshire. NB Langford shields. Langford shields look like a borrowing from and development of the Langton Barry shield. A number are listed in Glover/Edmondson. Langford Derbys Notts and Salop paly of 6 or and gu a bend arg is clearly very close and geographically close to Lincoln/Yorkshire. Other Langford shields tend to be Paly of 6 arg and gu often dropping the bend sometimes in favour of a lion passant in chief. 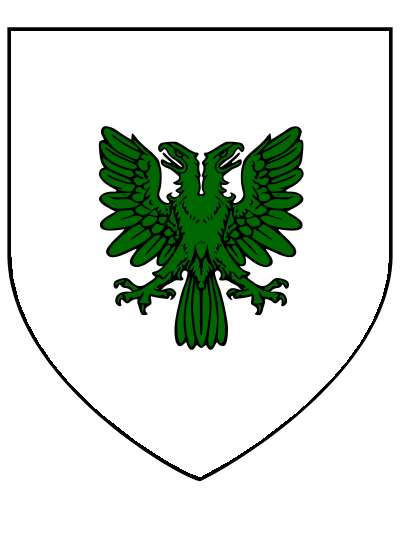 Mullets and eagles also get added and one Langford shield is simply quarterly gules and argent. Lincolnshire is in the eastern part of England. To the north is the giant county of Yorkshire, to the west is Nottinghamshire and to the south Cambridgeshire. There were at least two and possibly three Langton families from Lincolnshire as well as a Landon / Landen one. This shield is probably from Langton by Horncastle. If your name is Langton, Lenton or Landon and you come from these areas send in your DNA. A further separate family of Langtons originate from Nottinghamshire. If you are a Langton from Nottinghamshire or Derbyshire be the first to record this missing sequence of DNA that dates back to the time of Henry III in 1250. If you are a Langston, Landon, Langdon or similar from outside of the UK your name may have drifted in form and you may match one of these groups. Only a DNA sample will tell. 174 Paly of 6 argent and azure a bend gules. Hucknall Church Previously ascribed to Annesley who took their name from the next village to Langton Hall in Kirkby by Ashfield. Notably the colours are Grey colours. Now reassigned to Langton of Kirkby by Ashfield. It seems eventually to have become a annesley shield. The Langtons are using grey colours the greys in nearby Sandiacre are using Langton colours. 179 Or 3 piles meeting in the base Gules a canton ermine. Hucknall church Bassett of Drayton Bassett Staffs next to Middleton. Note the adoption of the Langton colours and the modification of the Paly of 6 to 3 piles. 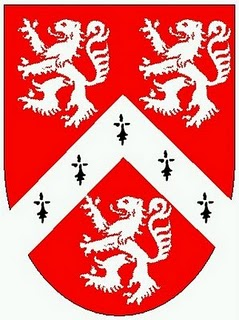 Other shields are simply thefts of the Langton one due to a similar name or a Langton connection Langford, Longford, Lamford, Lambford, Langdale. Newcastle is a large city in the far north east of England. In the past Langtons have been mayors of Newcastle. Their origins could be from the Langton / Lanton villages on the Scottish borders or from Langton in County Durham. There were three places called Langton / Lanton along the border and at least two of them gave rise to the surname Langton. However particularly in Scotland in Roxburgh, Selkirk and Peebles the name has drifted to Lanton or Linton. So if your surname is Langton, Lanton or Linton send in your DNA. The same applies if you are a Langton, Langthorne, Longhorn or Langhorne from Newcastle, County Durham or the North Riding of Yorkshire or Hull and Spurnhead. If you are a Langston, Landon, Langdon or similar from outside of the UK your name may have drifted in form. Send in your DNA results. The person who is recorded as being of Langton is Martin of Langeton in 1206 and whilst he may be the progenitor the recording of the roll was post Cromwell i.e. after 1660 which suggests more recent Langtons. The most obvious candidates are John Langton baker senior and his sons John a baker and William a goldsmith c 1515. Another candidate is Mayor and Sheriff William Langton c 1408 but his name occurs in association with a William Redmarshall (possibly an illegitimate Langton or a younger propertyless son) and so he looks like a Wynyard Langton and there is a William that fits well. Yorkshire is a giant county the largest in England situated on the east coast. To the north is Durham to the West is Lancashire which contains Manchester and Liverpool. To the south are Derbyshire, Nottinghamshire and Lincolnshire. We have five DNA sequences in this area including the sequence of the Langton Mayors of York. Besides Yorkshire there is in neighbouring Nottinghamshire /Derbyshire a seemingly separate group of Langtons for which we await the first person to come forward with their DNA. If you think your origins are within Yorkshire and the surrounding areas you will need to get DNA tested to find out which Langton village you originate from. There has been name drift within this area so if you have any of the following surnames you may wish to get DNA tested to see if you have DNA in common with the Langtons: Linton, Lanton, Langthorn, Langhorne, Longhorn, Longbones and Longsden /Longsdon /Longdon / Longden. If you are a Langston, Landon, Langdon or similar from outside of the UK your name may have drifted in form and you may match one of these groups. Only a DNA sample will tell. 191 Gules a chevron ermine between 3 lions rampant gold. Sir John Langton. Ashmole 834 An annotated blazon of the shields of arms tricked on folios 41-64 of Division IV. Adds: Blazoned in the military roll of Henry VI for Langton (?) a Yorkshire Knight. See FVY(Flower Visitation Yorkshire) 402 Archaeologia Aelina 3/3 1908 Military roll of Henry VI for Langton with lions gold. 192 Gules a chevron erm tween 3 lions ramp or those in chief facing (respectant) Two Tudor 2169The arms are said to be defaced perhaps a mistake for defamed. One suggestion is the lions tail is missing but the most likely one is that the lion is defamed from the rampant position and faces the wrong way i.e. respectant. 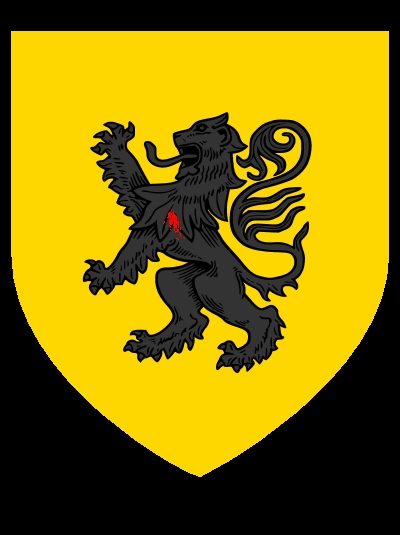 199 Gules a chevron counterermine between 3 lions rampant or. 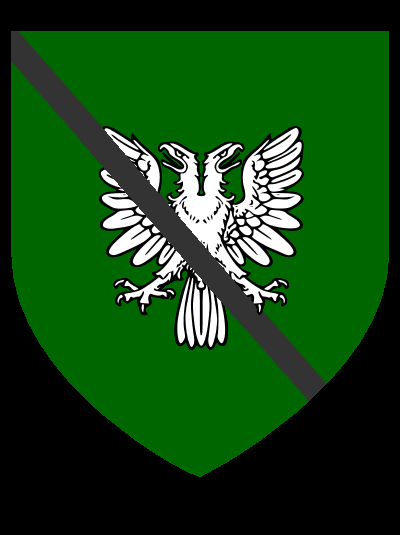 Shield of Dawkin Langton. Subsequently became the shield of the Dawkins. Despite being Chancellor, keeper of the Great Seal and in public service in church and state for over 50 years, John De Langeton continues to prove very elusive and that includes his origins. He was Bishop of Chichester on the South Coast of England 1305-1337. He had at least three sons or grandsons in the Chichester, Sussex area. So if you are a Langton, Langston or Landon from Sussex, Hampshire, surrey, Kent or London you might be descended from the great man. Please read the DNA article. Bishop Thomas was from Langton in Westmorland in the rural far west of England. The area used to consist of Cumberland, Westmorland and North Lancashire. Much of this area is now called Cumbria. Langton was an important settlement until destroyed by the Scots, since when it has been superseded By Appleby. The destruction of Langton may have caused the surname to become very unstable. Langton rarely occurs in this area but it is the main area for Langthorne, Langhorn, Longhorn, Langhorne etc despite there being no nearby settlements of that name. So if you have any of those names consider a DNA test because maybe you descend from Bishop Thomas. The bishoprics Thomas held were largely in the south of England and he had at least one son. So if you are from Wiltshire, Dorset, Berkshire or Hampshire and are called Langton, Langston or Landon have a look at the DNA project. If you are a Langston, Landon, Langdon or similar from outside of the UK your name may have drifted in form and you may match one of these groups. Only a DNA sample will tell. Robert like his father Thomas was a patron of Queens College Oxford. Bishop Thomas was from Langton in Westmorland in the rural far west of England. The area used to consist of Cumberland, Westmorland and North Lancashire. Much of this area is now called Cumbria. Langton was an important settlement until destroyed by the Scots, since when it has been superseded By Appleby. The destruction of Langton may have caused the surname to become very unstable. Langton rarely occurs in this area but it is the main area for Langthorne, Langhorn, Longhorn, Langhorne etc despite there being no nearby settlements of that name. So if you have any of those names consider a DNA test because maybe you descend from Bishop Thomas. The bishoprics Thomas held were largely in the south of England and he had at least one son. So if you are from Wiltshire, Dorset, Berkshire or Hampshire and are called Langton, Langston or Landon have a look at the DNA project. If you are a Langston, Landon, Langdon or similar from outside of the UK your name may have drifted in form and you may match one of these groups. Only a DNA sample will tell. 233 Argent a chevron sable between 3 lizards heads sable LANGDON of Keverell Burke The Langdon’s land was the Lizard Peninsula in Cornwall the southern point of which is Lizard Head. The connection with the above shields seems therefore to be a coincidence. Chesham is in Buckinghamshire north of London, Purleigh is in Essex to the East of London. 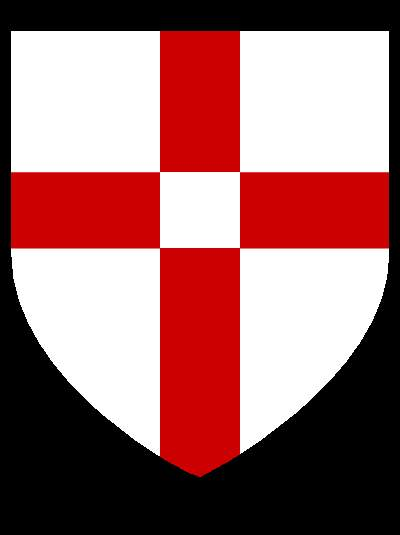 If you are from London, Buckinghamshire, Hertfordshire, Berkshire, Bedfordshire or Essex and have the names Langton, Landon, Landen, Langston Langhorne, Logsdon or Langthorne consider a DNA test you may find this shield belongs to you. We have the DNA that relates to this shield and three more sequences from the south of England. 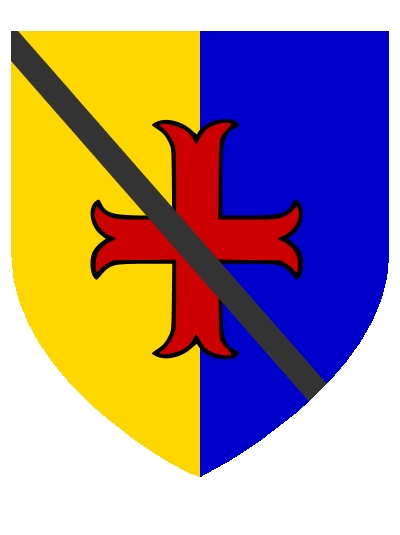 It seems appropriate to guess at Gyronny of 8 or and azure an inescutcheon argent as the Langton shield used in Chesham from the time of Walter’s death in about 1322 with the name drifting to Landon. The Crest is both given as a lion emerging from its den in an awful bit of canting Lion-den and as a lizard. 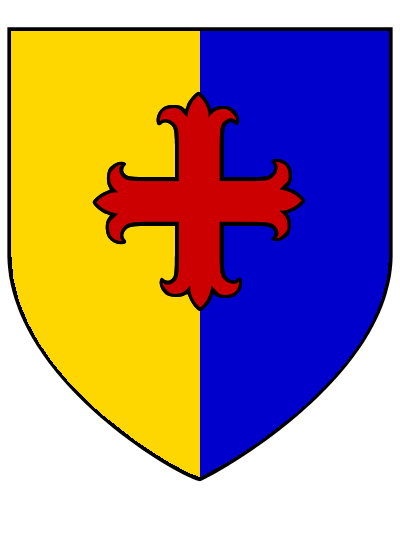 This is the shield used by Giles Brianson which he seems to have langtonised added the Langton bend of his grandmother/great grandmother. Of course this could have been added a generation or two before. I guess it counts as the Purleigh secret Langton shield. He must surely have known he was a Langton not least because his cousins in Chesham were calling themselves Langton/Landon. 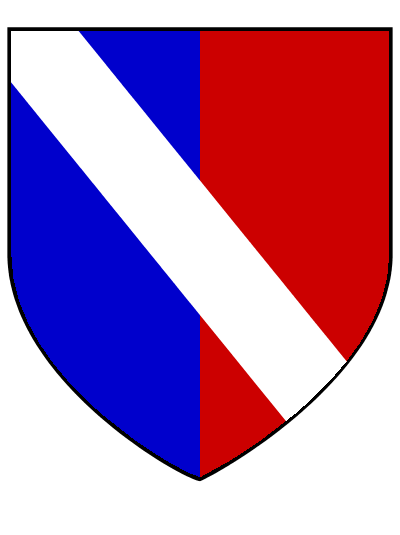 243 Gyronny of 12 azure and argent a bend gules. However there is nothing to support the ascription of gules to the bend, it was in all likelihood or (gold) following previous Lincolnshire Langton bends. Walter’s mistress Joan seems to be of Langton descent Lincolnshire/Essex. It should be noted what a bizarre design this is, obscuring the central point of the gyronny. There is only one parallel sable and or bend gules LAND which looks late and may be a copy. 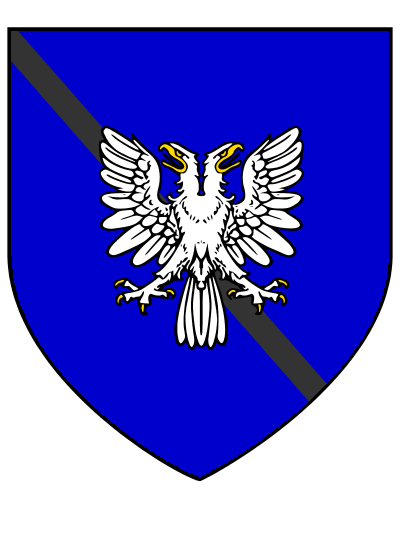 Papworth givesgyronny of 8 argent and azure Sire Johan de Briaunsoun. Also Gyronny of 12 argent and azure Brianton or Beranton, Gyronny of 12 azure and argent Bartholomew de Brianton Acre roll 1192. 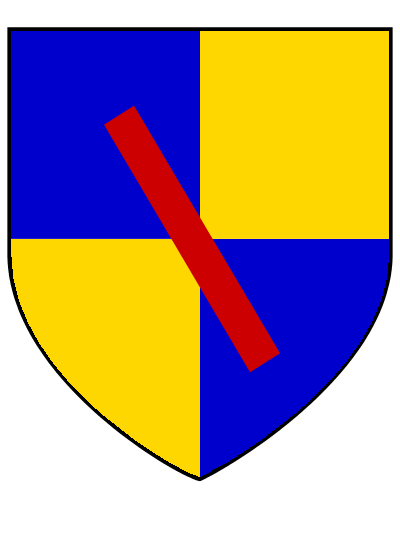 However Timms illustrating the shield from Dering, Camden, Heralds and Charles rolls always shows a gyronny of eight. Landon is a related name to Langton. The situation with Landon is however rather complex. It doesn’t seem to be an independent claim; in some cases it derives from Langton, in some cases it derives from Langdon, one group derive from Lincolnshire see below, other Landons seem to derive from a Flemish church in London. Some Landons in America seem to come from France but other claims of French descent are speculative. Have a read of the DNA project. This family was sometimes called Langton some times Llanden and sometimes Landon. They come from Danby in Lincolnshire next to Langton by Spilby and are genetic Langtons possibly with descendants in London. The fact that this occurs in the addendum suggests that it was in use in Robson’s time 1830, but where? The book was published in Sunderland. The fact that in the addendum of the 6 new entries two seem to have a common source [Ex. Coll.Armor. 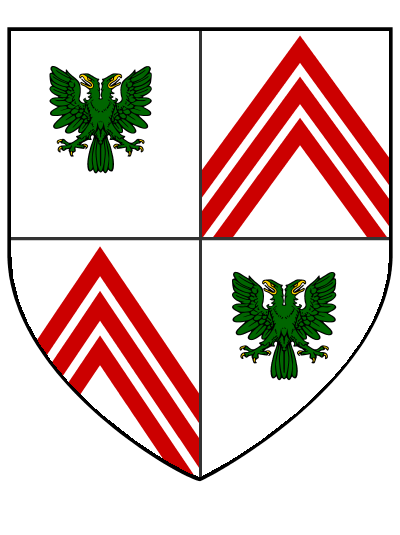 ], one is the late modern arms shield of Lincoln, whilst the other two are local north east shields with almost duplicate entries, it seems more likely than not that the silver eagle was a shield local to the north east that Robson was familiar with. This may explain why no locality is given. 262 Gules an eagle displayed argent in chief argent 3 roses gules. Linton Scotland Burke but I found this on zazzle which is usually accurate for Lenton presumably there is some relationship between these two. The answer looks as if it is located in the North of England/Borders in Scotland and presumably involves Linton and perhaps Lanton and Lenton. A further puzzle is why Burke and Papworth don’t list it, in contrast to their listing of the Saltire below, perhaps they didn’t read the Addendum! County Durham is in the North East of England to the north of the giant county Yorkshire. Further north still is Northumberland with the city of Newcastle upon Tyne and the northernmost town Berwick which is in England although Berwickshire is in Scotland. The Durham Langtons originated from around Middlesborough and Darlington but they spread to Newcastle and up to Berwick and the Scottish borders. There were three places called Langton / Lanton along the border and at least two of them gave rise to the surname Langton. However particularly in Scotland in Roxburgh, Selkirk and Peebles the name has drifted to Lanton or Linton. So if your surname is Langton, Lanton or Linton and you come from the borders send in your DNA. If you are from Newcastle or Northumberland and you are a Langton you are an endangered species-get tested. The same applies if you are a Langton, Langthorne, Longhorn or Langhorne from County Durham or the North Riding of Yorkshire or Hull and Spurnhead. If you are a Langston, Landon, Langdon or similar from outside of the UK your name may have drifted in form. Send in your DNA results. The lion originally belonged to the Lisle family in some form. 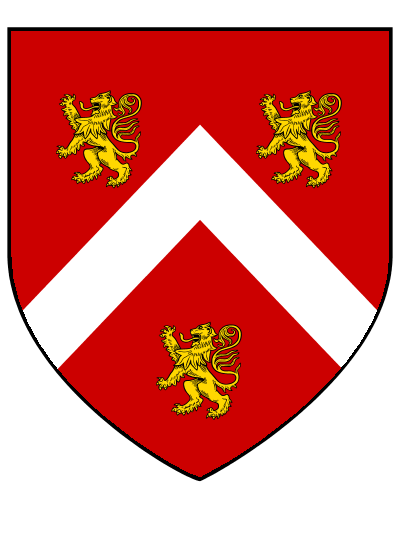 The Langtons had a double inheritance through the Lisles firstly when Alan Langton inherited Grindon and Redmarshall through his wife c1305 and then their son John was heir to his uncle John Lisle about 1340. This is probably when the Langtons adopted/inherited the Lion shield. 276 Argent a lion ramp sable vulned proper on the shoulder sable, bordure gules Jenyn’s Roll Thomas Langton Wingarde Temp EII 1307-1327 quoted in Some Feudal Coats. Also cited by The Antiquity 1880. The Windsor lion is so similar to the above that it is juxtaposed here. It differs from 133 only in the respect of lacking the vulning on the shoulder. The four records of 132 Surtees, British Herald (2) and Burke have all intentionally or accidentally dropped the vulning on the shoulder. Windsor is in Berkshire. Berkshire is a county in the south of England to the west of London. It is surrounded by Wiltshire, Oxfordshire, Hertfordshire, Surrey, Hampshire and Dorset. We have three DNA samples from London and the South of England, two of which are haplogroup I and one is haplogroup j2a. To find out if you match any of these you will need to get swabbed. There has been considerable drifting of the form of surnames in London. If your family originally comes from these areas or Berkshire and your surname is Langton, Langston, Langstone, Landon, Lenton, Langthorn or Langhorn then please get DNA’d. If you are a Langston, Landon, Langdon or similar from outside of the UK your name may have drifted in form and you may match one of these groups. Only a DNA sample will tell. So if you are a Langton, Langdon, Landon or Langston from Wiltshire, London, Bedfordshire or Northamptonshire read the DNA article. County Durham is in the North East of England to the north of the giant county Yorkshire. Further north still is Northumberland with its northernmost town Berwick which is in England although Berwickshire is in Scotland. There were three places called Langton / Lanton along the border and at least two of them gave rise to the surname Langton. However particularly in Scotland in Roxburgh, Selkirk and Peebles the name has drifted to Lanton or Linton. So if your surname is Langton, Lanton or Linton and you come from the borders send in your DNA. The same applies if you are a Langton, Langthorne, Longhorn or Langhorne from County Durham or the north riding of Yorkshire or Hull and Spurnhead. If you are a Langston, Landon, Langdon or similar from outside of the UK your name may have drifted in form. Send in your DNA results. We possess the DNA from Great Langton (Langton on Swale) and Little Langton but need confirmation from a Langton resident of Yorkshire. If you are a Langton from this area please consider getting a DNA test. 291 Robert de Langton of Little Langton Yorkshire had a seal of a fleur de lys. It might have represented all or part of a shield design. 292 Azure 3 Fluer de Lys ermine De Burgh of West Drayton, Middlesex. Mr Fysh Coppinger of West Drayton Middlesex inherited 1763 his mother’s (nee Fysh) land in Yorkshire (Scarborough) and elsewhere, proved descent 1773 from the De Burghs of Gainsborough Lincolnshire. A De Burgh was Chief Justice temp King John and one of the 25 surety barons of Magna Charta (Shield 7 lozenges). 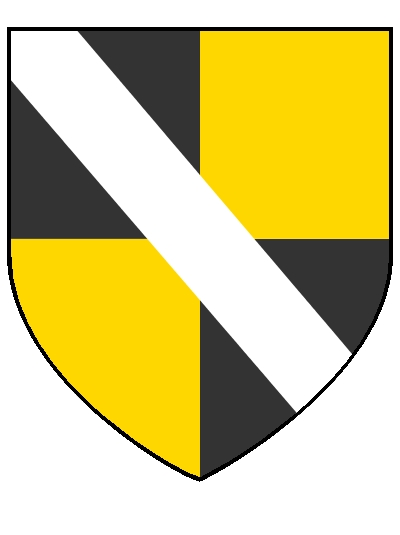 Coppinger assumed the name De Burgh becoming Fysh de Burgh and was allowed the above shield. His wife was Easter de Burgh and they of course named their son Fysh. As he was trying to establish his claim and antiquity it presumably had some provenance as he adopted it rather than pursuing the lozenge shield with a difference. The De Burgh’s were the next presenters of to the church in Great Langton after the Langtons but while they were still in the area and seemingly connected. It looks like the right of presentation descended through the female Langton line to the De Burghs and presumably the coat of arms went with it. 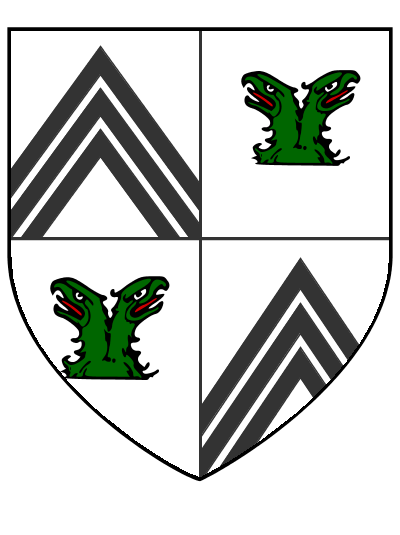 It is plausible that this was the Langton coat of arms. 301 On a shield a squirrel erect.Seal dated 5th November 1318 McDonald: Scottish Armorial Seals. Not sure actual design. Squirrels are of course the red squirrel and should not look like the American grey tree rat. Heraldic squirrels are usually on a branch and holding a nut. The fact that the Langton squirrel is on a shield suggests that this actually was a shield and not just a seal. No colours are given and whilst it is tempting to give it a naturalistic gules it could be any colour. There was one David Langton in Berwick and another possibly the same person on the Scottish side of the border. There were three places called Langton / Lanton along the border and at least two of them gave rise to the surname Langton. However particularly in Scotland in Roxburgh, Selkirk and Peebles the name has drifted to Lanton or Linton. So if your surname is Langton, Lanton or Linton and you come from the borders or Northumberland send in your DNA. We know Langtons also moved from this area down to Hull in Yorkshire. There were three places called Langton / Lanton along the border and at least two of them gave rise to the surname Langton. However particularly in Scotland in Roxburgh, Selkirk and Peebles the name has drifted to Lanton or Linton. So if your surname is Langton, Lanton or Linton and you come from the borders send in your DNA. 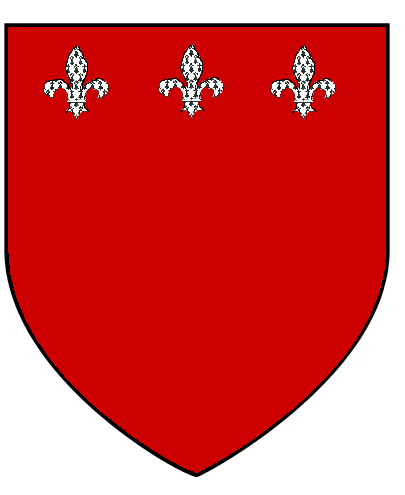 The Langtons, Mayors of Kilkenny claimed descent from the Lancashire Langtons with argent three chevrons gules. However the basis of this claim looks suspect and we know there were a number of different Langton groups in Ireland including Bishop Walter’s descendants and Lincolnshire Langtons. We have the relevant DNA to tell we just lack the irish samples. So if you are an Irish Langton and particularly if you are from Kilkenny isn’t it time to solve the riddle. This shield is from descendants of the Kilkenny Langtons. 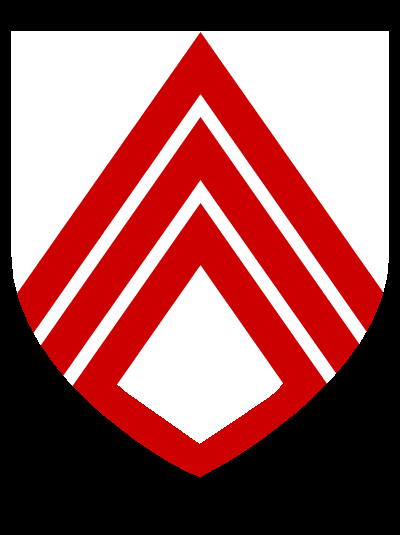 The Langtons, Mayors of Kilkenny claimed descent from the Lancashire Langtons with argent three chevrons gules. However the basis of this claim looks suspect and we know there were a number of different Langton groups in Ireland including Bishop Walter’s descendants and Lincolnshire Langtons. We have the relevant DNA to tell we just lack the Irish samples. So if you are an Irish Langton and particularly if you are from Kilkenny isn’t it time to solve the riddle. Glanton seems to be the gaelic pronunciation of Langton. We have glanton DNA which is consistent with Bishop Walters group. The question is how does that DNA relate to these shields. If you are a Glanton please send in your DNA. The Gore’s assumed the name of Langton after marrying the Bristol/Bath Langton heiress. The Langstons and Langstones in England are in two groups, one north west of London in Buckinghamshire, Bedfordshire, Berkshire, Hertfordshire and Oxfordshire where we believe we have the DNA but we would very much like confirmation of this. So if you are a Langston, Langton Lunnon or Landon from these areas send in your DNA. The second probably unrelated group of Langstons are from the English Midlands Warwickshire, Worcestershire, Staffordshire and Leicestershire. If you are from these areas and your surname in Langston, Langton, Landon or Lenton please read the DNA project articles. 400 Or a chevron gules between two roses seeded and barbed proper in chief and a dolphin hourant in base azure. Browne Willis History and antiquities of Buckingham 1755. Lipscomb 1847 following Buckinghamshire Vol 3 adds: A mullet argent for distinction on the chevron. Crest Two Wyverns heads with interlaced necks. Detail taken from tomb of John Langston 1506 in Caversfield church and doorway in church. He had 12 sons and 10 daughters. This design was apparently later abandoned for a Yorkshire Langton type design. The larger Langston group in Oxon/Bucks have a shield remarkably like the Yorkshire Langton shield which either suggests a copy or a relationship. By which I mean shields of names that are or maybe derived from Langton. Whilst there are two Lenton villages with different derivations, one in Nottinghamshire, the other in Lincolnshire, the distribution of the name doesn’t match these places but rather mimics the Langton name distribution being particularly concentrated in Leicester City. There looks as if there has been considerable mixing of the two names. Moreover Lenton in Lincolnshire is sometimes called West Langton. this is going to be a real headache to sort out please send in your DNA. I suspect Longden / Longsden is in fact a separate name from Derbyshire but confused with Langton. Both have a high concentration in Codnor Derbyshire. So if you are a Derbyshire or Nottinghamshire Langton, Longden or Longsden please send in your DNA. A further complication is that the name Logsdon crops up in small numbers in Hertfordshire and London and may have an entirely separate origin. So if you are a Logsdon from Hertfordshire, London or Bedfordshire consider being tested. Who knows we may find a match for you. 441 Argent on a bend engrailed azure between two bucks heads cabossed sable, an eagles head erased between two escalops or. Burke Nottingham. Taken from Sherwin arms 1818 and Gregory 1860. 443 LONGSDEN An eagle displayed with two heads Little Longsdon Co Derby said to be Temp Edward I Burke Now Little Longstone and Great Longstone. In the visitation of Derbyshire 1611 Stephen Longsden of Longsden was disclaimed of being a gentleman. Subsequently in 1628 following a fuller investigation he was recognised, I imagine money helped. His arms are not declared. The idea of a grant of arms in temp Edward I must surely be a fiction. They are said to descend from Matthew illegitimate son of the Rector of Bakewell before temp Edward I. Subsequently they are said to be a double headed eagle but no tincture give. I wonder where they got that from? 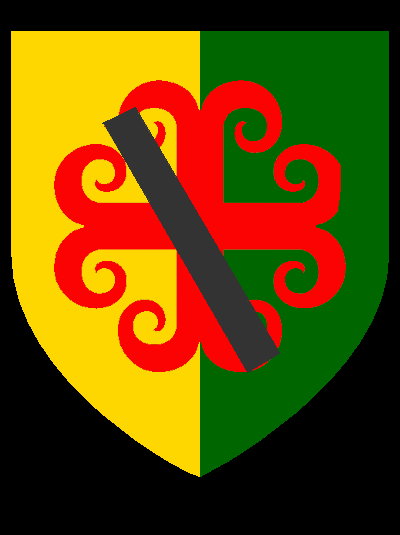 451 Paly of 6 argent and sable on a chief gules a lion passant guardant or Berry This is borrowed from the Langford shields. 483 A quartering of argent 3 chevrons gules a canton gules with a star of 5 points or on WARBURTON of Arby said to be from Cheshire Visitations ORREBY more likely a LANGTON shield with the canton for difference. There is clearly a lot of scope for confusion between Laughton and Langton. Moreover the villages seem to conspire to occur in proximity to each other. Laughton in Lincolnshire was sometimes called east Langton. This will be a real headache to disentangle. Time to get tested and send us the results. 492 Argent., a wyvern volant sableLANGTON Thomas Gerard of Trent(1592-1634) The Particular Description of the County of Somerset p31. Editor of 1900 Rev E Bates in index writes error for LONGLAND. The same book records the name as LANGLOND. The arms are in fact theft of the Langley Cockatrice which is almost identical to the Wyvern. The colours are identical. This family tried to borrow both from the Langleys and the Langtons See No 537 Ar a chevron gules cortised. 493 Argent a chevron azure between 3 Cornish Choughs LANGTON Lysons the environs of London Vol 3 Middlesex Willsden This is almost certainly a mistake. The document is recording the LANGTON/BARNE tomb and gives the correct LANGTON Yorkshire arms. 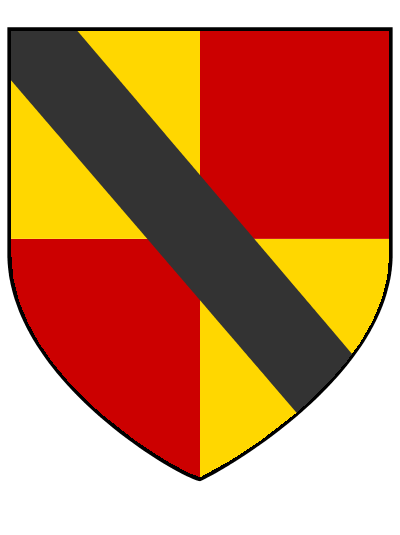 551 Quarterly per fesse indented or and gules De LAUGHTON of Laughton en le Morthen previously a cross between four Quatrefoils within a bordure. 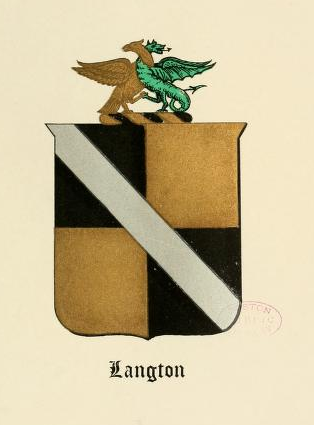 The similarity of this name with Langton is such that we suspect some confusion. The results would be interesting to see. 552 Quarterly per fesse indented or and gules LEIGHTON. Leighton and Langton are separate names but there may have been some mixing. By all means send in your DNA results. 554 Argent on a cross gules 5 roses of the first LINTON Cambridgeshire Papworth. Bishop John Langton of St Davids was Chancellor of Cambridge University and there were certainly Langtons around Cambridge soon afterwards who may have been his descendants. If you are a Langton or Linton from Cambridgeshire try a DNA test. Latton is another surname very close to Langton and there has probably been some mixing. It would be interesting to see your DNA results. Longstaff, Longstaffe, Langstaff, Langstaff are a group of names that only seem to occur in Langton areas. This casts doubts on Bardsley’s suggestion that the origin is a nick name for a baliff or officer of the law. Why would that only happen in Langton areas. If you have this name and have already had your DNA tested please send us the result, if not please get tested so that we can solve the mystery of the relationship between these names and Langton. William Berry 1774-1851 published his version of Glover with additions 1828-1840 in 4(5) volumes including an extensive appendix of further additions.